Blackshirts & Reds explores some of the big issues of our time: fascism, capitalism, communism, revolution, democracy, and ecology-terms often bandied about but seldom explored in the original and exciting way that has become Michael Parenti's trademark. Parenti shows how "rational fascism" renders service to capitalism, how corporate power undermines democracy, and how revolutions are a mass empowerment against the forces of exploitative privilege. He also maps out the external and internal forces that destroyed communism, and the disastrous impact of the "free-market" victory on eastern Europe and the former Soviet Union. He affirms the relevance of taboo ideologies like Marxism, demonstrating the importance of class analysis in understanding political realities and dealing with the ongoing collision between ecology and global corporatism. Written with lucid and compelling style, this book goes beyond truncated modes of thought, inviting us to entertain iconoclastic views, and to ask why things are as they are. It is a bold and entertaining exploration of the epic struggles of yesterday and today. Michael Parenti is one of the nation's leading progressive thinkers. He lectures widely around the country and is the author of Dirty Truths, Against Empire, Democracy for the Few, Land of Idols: Political Mythology in America, and many other books. He lives in Berkeley, California. "A penetrating and persuasive writer with an astonishing array of documentation to implement his attacks." We'd be a better people if we all read this book. I can pretty much guarantee that if you read "Blackshirts and Reds: Rational Fascism and the Overthrow of Communism," the corporate media will never be able to manipulate you into voting or working against your own interests by taping into that gut-level fear of the word "communism." As one who just turned 60, I can say that for my generation, raised as we were under McCarthyism, that's a fearsome weapon they've been using against us. I have long loved reading Parenti's books and listening to his lectures - live or recorded. ("The Assassination of Julius Caesar" is my favorite so far.) I especially wanted to read "Blackshirts & Reds," but it's out of print, so I sure appreciate Ebay being able to find this for me. (By the way, I'm also reading his "Contrary Notions: The Michael Parenti Reader," which you can get through your local independent bookstore; there's a link to help you find one on his website, www.michaelparenti.org/books.html.) 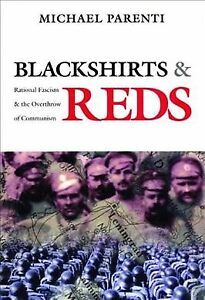 Why am I so excited about reading "Blackshirts & Reds"? I can't say I am "enjoying" the chapter I'm reading now - it's hard to enjoy reading about the crushing of people's hopes and struggles (however temporary this might be before they inevitably rise up again.) But I'm learning so much that we all need to know about our nation's support of rightwing governments - including the Nazis and Italian fascists - and its unceasing attempt to crush every leftwing government and popular movement throughout the world. However, I have no doubt that he'll leave us on a hopeful note, because I know his work. Parenti, as always, has done some very intense research so we won't have to do it all ourselves. He is fair. He doesn't even try to make any leftist government look perfect; he writes about their failures. But then he documents the good they accomplished for their people and points out how most of their problems come from the meddling of our government, corporations, and media. The "rational fascism" of the subtitle refers to the evils of rightwing governments (including our own current one) not coming from leaders' stupidity but from their rationally manipulating the situation to their own interests. It's not that they can't give us peace, healthcare, affordable housing and education for all; it's that that's not what they've set out to do. Thank you, once again, Michael Parenti.